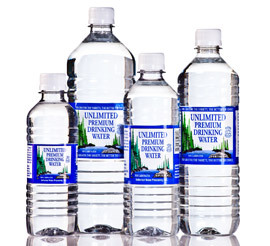 Unlimited Water Processing, Inc. is a fullservice bottled water manufacturing and distribution company with its operations located in St. Louis. Product offerings include 12oz, 16.9oz, 24oz, 1 liter and 1 gallon distilled one way bottled packages as well as refillable 5-gallon bottles. 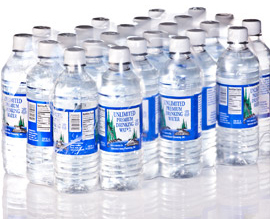 With over twenty years in the bottled water industry, Unlimited Water has been a leader in the production and packaging of bottled water. Unlimited Water Processing stared in 1980, and their success can be directly attributed to having knowledge of the market and the ability to envision the needs of others. Unlimited Water Processing produces purified water using a series of highly sophisticated physical-chemical treatment processes. The incoming source of water is taken from Missouri American Water Company and further processed to meet the quality requirements for bottled water. All aspects of our bottled water from the incoming source of water to the actual cap and seal of the bottle exceed federal, state and industry standards. Unlimited Water Processing is a member of the Central States Bottle Water Association, International Bottled Water Association (IBWA) and inspected by the National Sanitation Foundation (NSF). We are also certified on a yearly basis to ensure our water meets high standards and the guidelines set forth by the federal government.